Easy sambar recipe Kerala style in pressure cooker is a very easy one pot mixed vegetable sambar recipe that can be prepared really fast. You do not have to use many dishes to prepare this sambar, as this easy sambar recipe is a one pot sambar recipe too, as we only use a pressure cooker to make this easy Kerala style mixed vegetable sambar. You can make this easy sambar recipe without sambar powder or with sambar powder as you wish, as I have explained in the recipe how to make the sambar without sambar powder using individual spices. This is also an easy sambar recipe without coconut and without jaggery. It is delicious and healthy as well, it is just that we do not entirely follow the traditional way of preparing the lentils first, but we cook the lentils and vegetables together and we add the seasoning first in the pressure cooker itself. So you really don’t have to use different utensils to prepare the sambar using this easy sambar recipe. I have already explained in my previous post, how we can prepare the authentic South Indian style sambar using the authentic traditional sambar recipe where we cook the lentils first. 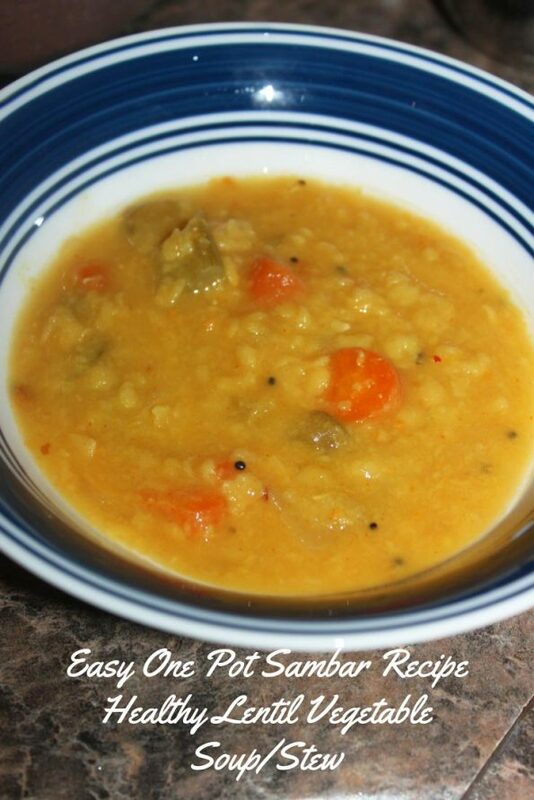 In this easy sambar recipe, feel free to use your favorite vegetables. You can make sambar using mainly one kind of vegetable, like this easy tomato sambar recipe or cucumber sambar recipe, or you can use a mix of different kind of vegetables. In this easy sambar recipe Kerala style, we are using a mix of few different kinds of vegetables. You can use the spices I recommend or you can use a ready to use sambar powder which will have all spices needed for sambar recipe. You just need to follow the pacjage directions if you use a ready made sambar powder. I almost always add all the spices needed for samabar and then I add 2 teaspoons of sambar powder to add extra flavor which makes it more delicious too. You don’t have to use too many vegetables, but sambar recipes call for a good amount of vegetables. So I recommend using 3 to 4 cup of chopped vegetables along with 1 cup of dal or lentils (the lentils we use is yellow pigeon peas which is known as toor dal in India). Chopped drumsticks make a good combination for sambar so you can use them if that is available. Shallots or samll onions make a good combination so you can use them as well, but if it is not available feel free to use regular onions. Tamarind extract made from tamarind paste is used in smabar recipes to add sourness, but if you don’t have tamarind extract or don’t want to use tamarind, you can use more number of fresh tomatoes to add sourness to the sambar. As I already mentioned in my previous post on authentic south Indian sambar recipe, there is a particular way to chop veggies for sambar. Most of the vegetables are peeled (cucumber is an exception where only seeds are removed), and seeds are removed and they are cut lengthwise to make small and long pieces (uniformly cut). That is how veggies are chopped for sambar, but even if you cut them into cubes, you can definitely make very yummy sambar with all the exotic flavors. So even if you don’t care to cut the veggies the traditional way, feel free to cut them into small pieces for this easy sambar recipe, and make this one pot sambar in pressure cooker easily and quickly. So here is how you can make easy sambar for rice, dosa or idli using this easy sambar recipe in pressure cooker. As I already mentioned the part of chopping the vegetables, I am not talking about it more, assuming you have done washing and chopping the veggies you want to include in your sambar. So here is the ingredients you need to make this easy sambar. I am going to use potatoes and carrots in this easy sambar recipe (even though that is not included in my previous recipe for sambar). In fact, I love potatoes in sambar 🙂 and I have a simple and easy recipe for potato sambar here which is super easy to make and very delicious too, you can enjoy it with rice, dosa or idli. So here is the easy South Indian Kerala style sambar recipe made using mixed veggies using a pressure cooker. Easy South Indian Kerala style sambar made using mixed vegetables, spices and dal (split yellow pigeon peas) makes a quick, easy, delicious, healthy side dish or curry with rice, idli or dosa for lunch, breakfast, snack or dinner. Heat oil in the pressure cooker, add the mustard seeds. When the mustard seeds starts to splutter, add the red chilies and curry leaves fry for a few seconds. Now the seasoning is ready, you may skip this step if you are not using the seasoning. Add the chopped veggies to the seasoning, saute for few seconds. Add the washed lentils (yellow pigeon peas) to the veggies in the cooker, saute for few more seconds. Now add the salt and spices - either instant sambar powder or all the individual spices and mix well. Add the filtered tamarind extract (tamarind paste dissolved in water and filtered) to the cooker and mix everything well. Close the pressure cooker with the lid, make sure you use the safety valve and follow all directions in the manual as this is very important for safety while using pressure cookers. Cook in medium heat for about 10 to 12 minutes on until 3 whistles come. Wait for the pressure cooker to cool down before you open the cooker. When the pressure cooker is cool enough, open the cooker and see of all the ingredients are cooked enough. This is when you can check if salt is enough and if if the gravy is enough. In case you need more gravy you can add more water and just heat it up with the lid open for 1 more minute. If you feel the gravy is more, you can heat up for few more minutes without the lid, as the sambar cools down it will thicken naturally. If you are using chopped coriander leaves (cilantro leaves), you can add it now, gently mix and it is done. One pot sambar made in pressure cooker is ready to be used! Serve the healthy and delicious sambar with rice for lunch or serve it as a dip for dosa or idli for South Indian breakfast, snack or dinner! 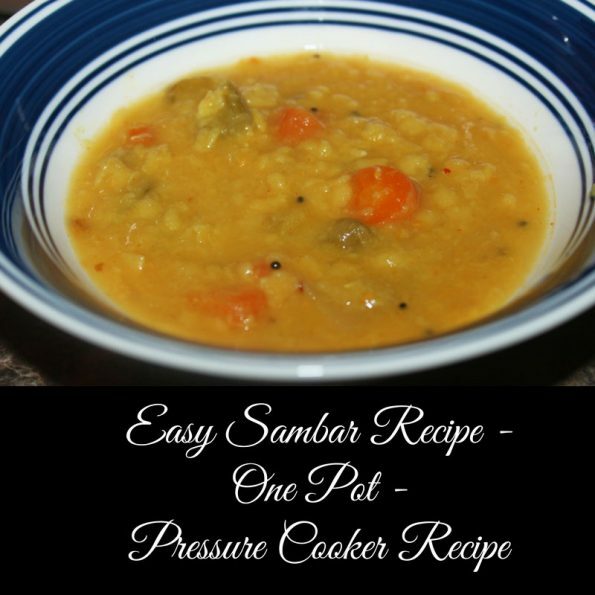 Hope you found this post on easy sambar recipe for rice, dosa and idli made in pressure cooker helpful!